It’s not too late to plan an affordable Spring Break vacation. In fact, there are many Spring Break ideas for families and affordable April vacation destinations in the beautiful Finger Lakes region of New York. What’s more, Cayuga County is the perfect destination for art lovers! With events and attractions in Cayuga County ranging from art exhibits to art classes, art walks to artistic landmarks, and everything in between, you’re sure to discover the best ways to spend Spring Break. To start planning your Spring Break, just look at what’s happening in the Finger Lakes in April 2015 to create a relaxing get-away or plan a fun-filled vacation that’s right for you. Among the places to stay in Cayuga County for art lovers are uniquely designed B&Bs, quaint guest homes, and country inns. These Finger Lakes accommodations boast a variety of amenities for couples, families, and individuals. Nestled in beautiful surroundings and small-town settings, your Spring Break accommodations will be within easy driving distance to Finger Lakes attractions. Then, plan to take in art exhibits in April 2015, which include Made in NY, an annual exhibit at the Schweinfurth Art Center in Auburn, New York, that showcases New York artists and their creativity. With something to inspire, delight, and pique the interest of just about anyone, the Schweinfurth Art Center 2015 Made in NY exhibit represents eclectic and innovative artistic mediums. The 2D and 3D artwork includes photography, ceramics, painting, drawing, fiber, installation, and video. And what’s great about the Schweinfurth Art Center is the affordable admission of only $7 for adults, with free admission for children under 12. But if you plan this Spring Break activity for First Friday (April 3), admission is free. 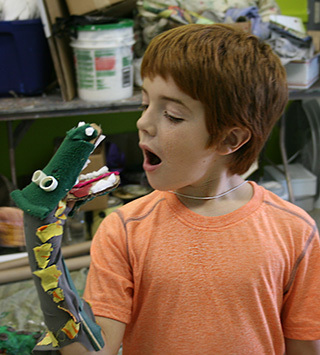 And if you are spending Spring Break with kids, then a week-long Schweinfurth Art Center Spring Break Art Camp can give you the grown-up vacation time you need, and the time away from their parents that your kids want! One youth spring art camp is Play with Clay—Design a Magical World with Fairies & Gnomes, where kids in kindergarten through 5th grade will work with design elements, explore size and shape, and add elements from nature to make a home for fairies or gnomes. The other youth spring art camp is Painting the Landscape in Watercolor, where kids in 6th through 12th grade will get a hands-on introduction to watercolor painting methods for creating a realistic scene. Both of the Schweinfurth Art Center Spring Break Art Camps run from Monday, April 6, through Friday, April 10, 2015. Student drop-off for these Spring Break art camps begins at 8:45 a.m., and the camp runs from 9 a.m. until 12 noon each day, so Spring Break parents can enjoy a leisurely morning of shopping in Auburn, or sight-seeing in Cayuga County. In fact, you can combine Spring Break sight-seeing with Spring Break shopping by following the Auburn Public Art Trail, which leads you to 13 outdoor mosaic projects and outdoor murals in and around downtown Auburn, New York. Because the featured artwork graces business exteriors or City of Auburn common areas, there are many opportunities for shopping, resting, taking in a show, and dining along the way. If you park your car at the City of Auburn Parking Garage on William Street, you can start your art trail there and view Chuck’s Views of Auburn Banner. Follow the Art Trail Map available at the Cayuga County Tourism Office at the corner of Genesee and William Streets, and you’ll then pass Auburn, New York bistros, craft beer pubs, coffee shops, and a variety of stores. Among them is the Finger Lakes Art Cooperative at 101 Genesee Street, the perfect place to purchase your Spring Break souvenirs. The elegant retail gallery is open Tuesday through Saturday, opens at 10 a.m., and features local Finger Lakes art work to support the burgeoning Cayuga County art scene. If you venture off the Auburn Public Art Trail and follow Seminary Avenue toward Nelson Street, you’ll reach Willard Chapel. 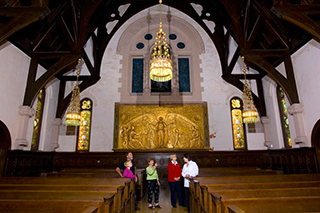 Built in the 1890s, the Willard Memorial Chapel interior was designed and handcrafted entirely by Tiffany Glass and Decoration Company of New York City and is the only complete and unaltered Louis C. Tiffany designed religion interior known to exist in the world. Willard Chapel is open from 10 a.m. to 4 p.m. Tuesday through Friday, and admission is a low $8 for adults, $5 for students and seniors 62+, and children 12 and under are free. Willard Chapel tours are given on the hour, every hour, with the last tour beginning at 3 p.m.
Want to pack even more into your Spring Break plans? Then check out more Cayuga County happenings at www.tourcayuga.com.